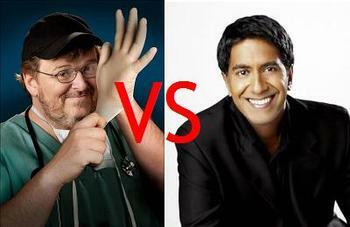 5 posts categorized "Michael Moore"
Michael Moore had a go at Dr. Sanjay Gupta this week when both were interviewed on Larry King's evening talk show. The results are thought provoking and explosive. Enjoy. A great Q&A session with the always brilliant Michael Moore from New York Magazine. 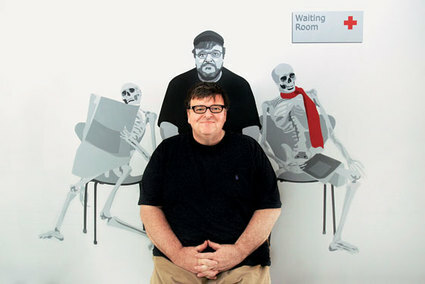 Thanks to my friend Carrie I found out that a trailer for the Michael Moore Film, Sicko, is available on line. This film looks so good! I'm so so so looking forward to it's release. It's too early to know what impact the film will have but, as I have said, if it gets a dialogue started then we are certainly moving in the right direction. Check out the trailer below. xox. 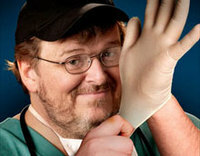 The always amazing and super awesome Michael Moore is coming out with a new film called Sicko. For this film Michael focuses his attention on the U.S. health care system - obviously a hot topic especially as we are heading in to a presidential election where topics like this take center stage. As expected, people are already up in arms over the film. Below you will find a clip from the new film which will be released on June 29th nationwide. Thank goodness for smart outspoken individuals like Michael Moore. He keeps an active dialogue flowing on subjects that actually mean something. He is absolutely the best.